Yesterday, in honour of my husband’s birthday (like I need an excuse) I made some brownies. I’ve never made brownies before but when I saw the recipe in Lorraine Pascale’s Baking Made Easy book, I couldn’t resist. Preheat the oven to 180c/350f/gas 4. Grease and line a 20cm/8in square tin. Wash hands. Explain to 2-year-old why they need to wash their hands. Position chair by sink, place 2-year-old on chair. Tell 2-year-old to stay still whilst you wash their hands. Tell 2-year-old not to get down. Recover 2-year-old from the other side of the kitchen and place back on chair. Wash their hands. Tell 2-year-old not to splash. Dry self and 2-year-old. Position a chair by your working area and place 2-year-old on chair. Melt the butter in a pan over a low heat. Remove from heat and intercept just before 2-year-old’s finger plops into the hot melted butter. Extract chopped chocolate from 2-year-old’s grasp and explain it’s not for eating now. Add the chocolate to the butter, leave for a few minutes. Intercept again. When the chocolate has melted, stir together. Remove celery stalk from pan. Tell 2-year-old to stir less vigorously. Clean up splattered butter and chocolate mix from worktop/splashbacks/microwave/coffee machine. Whisk the eggs, egg yolks and vanilla together in a large bowl until light and fluffy. Stop 2-year-old drinking vanilla extract. Add the sugar in 2 additions, whisking between each. Pour the sugar around the egg mix so as not to knock the air out. (Read: chuck the lot in, followed by the measuring bowl). Remove the bowl and keep whisking until the mixture becomes stiff. Once the egg mixture is ready, remove 2-year-old’s hand from chocolate mixture and pour in, again around the sides so you don’t knock the air out. Retrieve eggy whisk from 2-year-old and set aside. Add the flour, cocoa powder, salt and a third of the biscuits (or whatever you have left that’s not in the child’s mouth). Re-prepare the tin after finding the buttery paper on the dog’s head, stir until combined and pour into the prepared tin. Scatter the remaining biscuits (if you have any left) over the top, pressing them in slightly, and bake on the middle shelf for 25-30 mins. The middle will be slightly gooey. Pass chocolatey spatula to 2-year-old so you get A MOMENT’S PEACE and pour yourself a gin. 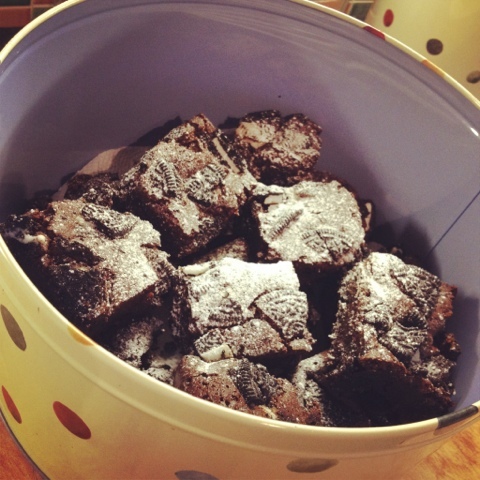 Leave the brownies to cool in the tin. The top may sink and crack slightly but this will only add to the texture and reflects perfectly on your state of mind. I just wish I’d taken more pictures, rather than just the end result. Cooking with toddlers is actually very frustrating funny and the state of the kitchen when we’d finished was laughable. Posted in Baking and tagged baking, brownies. Bookmark the permalink.